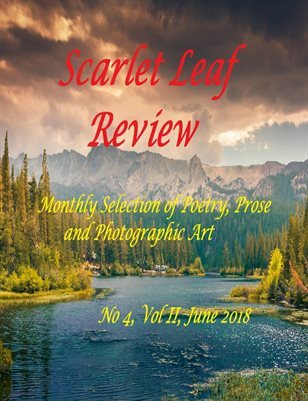 JULY ISSUE OF SCARLET LEAF REVIEW IS LIVE! The review is live, after five-day horrendous work. We featured 22 poets, 38 short-story writers and 3 nonfiction writers in this issue. There should have been more, but I couldn’t locate their approval emails. Some of the authors send replies to my emails using another email address than the one they initially used. Some authors didn’t bother to answer. We have a few every month. I don’t understand why they bother to submit if they don’t want to reply. Maybe they think that we don’t have enough reading material… I can assure you, we do. Anyway… From now on, we will take into consideration our submission guidelines. We struggle to format some submissions. Yesterday, I decided to simply let them as the author formatted them because I wouldn't have finished this review in another week. If I missed some errors – a big photo, a garbled category, don’t take it personally, just let me know. Believe me, it was a lot of work to format this issue. On a happier note, the review had 145,838 hits between June 15 and July 19, 2018. Good job, dear authors! That means we have reached 2,259,972 hits. Not bad, what do you think? I’d like to offer a huge thank you to the authors who have contributed to this issue, as well as to the authors featured in the past issues. As announced in May, we will have a new print magazine: Scarlet Leaf Review’s Treasure Chest, with two versions – Poems and Stories. Well, the two issues will start this month. We aim to have them in print between 27 and 31st. Don’t forget, if you move your mouse over JULY 2018, you find the drop-down menu, which shows poems, short stories and nonfiction. If you want to read the work of a specific author, click on the author’s name, on the right hand of the page under categories. Where are your submission guidelines so that I may not violate them. I would like to say Thank You So VERY MUCH! for all the work you do to publish this Wonderful Journal!